For commercial foundation repair in the Chicago area, United Structural Systems of Illinois is recognized as the leading structural repair and waterproofing contractor in Illinois, as well as your Chicago experts for building foundation repair. Since 1995, we have been providing high quality, cost effective and innovative foundation solutions to our customers. Our list of core services includes design-build earth retention, micropiles, foundation repairs, soil/rock nailing, permanent rock/soil anchors and structural underpinning. We are experienced in performing axial and lateral load testing that conform to ASTM 1143 standards. We welcome the opportunity to work with you in developing the right solution for your next foundation project. In 1995, United Structural Systems was founded with a goal to become the premier provider of foundation services in Illinois. Early on, our company established a reputation for quality, dependability and integrity. Today we continue to uphold that reputation with an expanded line of services which includes waterproofing, design-build excavation support systems, micropiles, soil/rock nailing, helical tiebacks, epoxy crack repair and building foundation repairs. For over fifteen years, our services have been utilized on significant construction projects in the commercial building, highway/bridge, industrial and power/transmission markets. United Structural Systems has the experience needed for any commercial foundation repair. No job is too big for us to handle. We use helical and steel piering for commercial foundation repair. 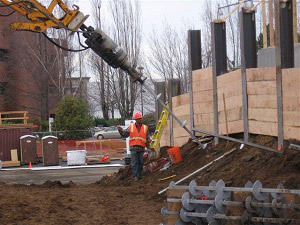 These piers will stabilize your commercial building's foundation by connecting footings and walls to solid, load-bearing soils. Go to our gallery to get a better understanding of the different types of commercial foundation repair jobs that United Structural Services has done. If you are in need of commercial foundation repair, we have the experience and products to get the job done. Don't hesitate, contact the experts at United Structural Systems today for your commercial foundation repair needs. We know that in all of our operations, safety is as important as the quality of our work. Providing a safe and healthy place to work for our employees and others working around us is a priority that we are committed to from our highest level of management to our jobsite crews. While everyone is empowered and responsible for carrying out our work in a safe manner, our operations manager oversees, evaluates, and updates our safety program, policies and procedures. The United Structural Systems operations manager performs jobsite safety audits and works closely with management, superintendents and jobsite crews to identify and eliminate possible hazard exposures, accidents and injuries. We believe that all accidents and injuries are preventable and we continuously strive to improve safety so that we will achieve our goal of zero jobsite injuries.